Critical Thinking Blog: All Opinions Are Not Equal: Why Only Fish? So, people like to rave about places where fish is the freshest. Whenever I go to the East coast in the summertime, I always get a lot of seafood, often caught that day. If you eat crabcakes in Kentucky, people will say you're wasting your money, 'cause it can't be fresh. Is it possible to get beef or chicken anywhere that's caught that day? And is the difference as significant as freshly caught, never frozen seafood? What makes seafood so unique in this regard? I grew up in Charleston, SC, and we were avid fishermen, shrimpers, crabbers, etc. 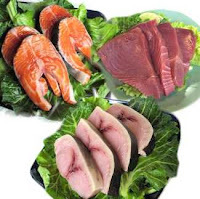 The difference between fresh and frozen is so drastic, that there are even some fish that you would never know were fish if someone didn't tell you, because they don't have that "fishy" taste or smell when fresh. I have also had same-day slaughtered chicken on a farm, and it tastes like, well, chicken. Not much different than what you can buy in the grocery store. I can't speak as to beef. But if the venison experience is comparable, I have had that fresh and after being frozen, and couldn't tell much of a difference. Perhaps the seafood difference has something to do with the density and texture of the meat? yeah, that's a good tip for all of you out there, ask catholics why they don't eat fish on friday, then when they say it's part of their religion...ask them what it's based on? boy, the frazzled look of terror is priceless. That's a good tip in general. Make people question why they believe what they believe. If they have to, for the first time, question it themselves, that can be a good first step to thinking in general. I'm Catholic. Catholics DO eat fish on Friday. They don't eat meat (beef, chicken, pork) on Fridays during Lent. The reason they do is that it is considered a sacrifice to abstain from meat, and the Lenten season is about sacrifice. Historically (I think), it began when Italian fisherman were suffering financially due to the increased popularity of meat. Oh, meant to ask, do I look frazzled or terrorized? i apologize, i misspoke, i meant why ONLY fish on fridays. laurens' comment was from her grandmother's explanation this past weekend on the biblical reasoning for it...something like "God only had fish on Christmas Eve." My goal was to help her understand that it was not a biblical command. I appreciate your answer, JMC. So, it is not based on biblical tradition, but Catholic tradition from hundreds of years later? and although i meant the "frazzled" reference specifically in terms of Lauren's grandmother from this weekend (even that was an overstatement), I see now that my comment came across as very condescending toward Catholics in general. I apologize for that JMC. Oh, that's okay. I think as a general rule, people don't understand their own religious traditions, let alone those of others. As for the tradition, I believe it is Catholic, not biblical. Which would make sense, since I don't believe other denominations practice it. The Seven Sacraments of the Catholic Church -- baptism, penance, Holy Eucharist, confirmation, marriage, holy orders and the sacrament of the sick. The seven sins of the world -- pride, envy, anger, gluttony, sloth, lust and greed. The seven days it took Mary and Joseph to travel to Bethlehem. "Some say it's the seven hills of Rome, some say it's the seven winds of Italy, or the Seven Wonders of the World," he says. So this one is totally just a tradition, so old that no one really knows where it came from.